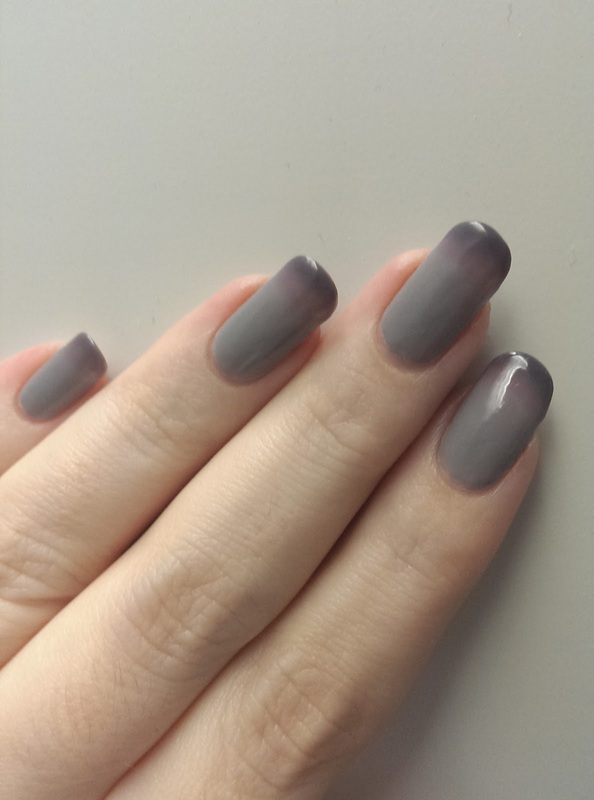 I bought Dance Legend Termo Trio 3 from Color4Nails last fall and had worn it once before, but I my first photos didn't do it any justice. It's a tough one to photograph, because it changes so suddenly and capriciously. There are a ton of photos in this post because I wanted to catch as much of its range as I could and get as close as possible to sharing the experience of wearing it. Sadly, it seems to be out of stock everywhere that I checked. I hope it isn't gone for good! Termo Trio 3 is a thermal cream that goes from light gray (hot) through pink to dark purple (cold). This stuff is so damn awesome I can hardly stand it! Even applying it is interesting. It reacts so quickly to temperature changes that it transforms as you brush it on. 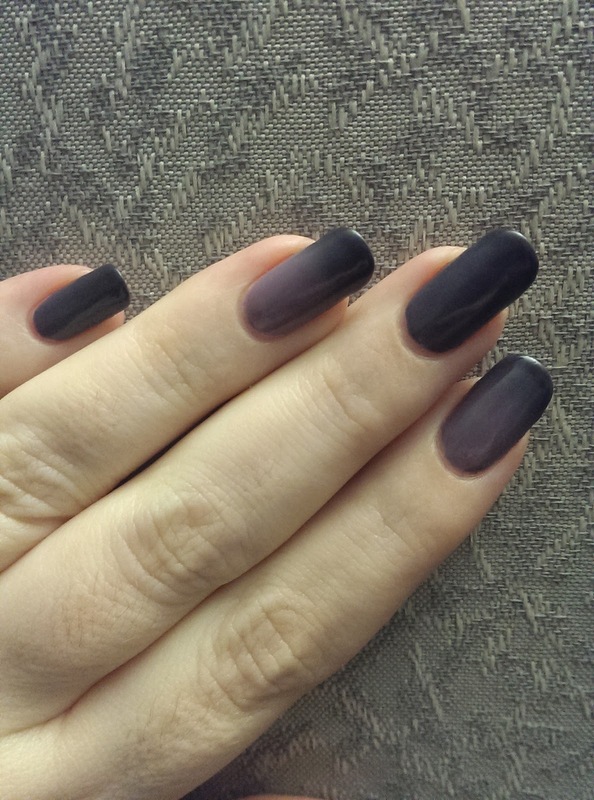 The first time I wore it, I used three coats, since the formula is chalky and a little bit difficult. Since I knew what to expect, I was able to use just two coats this time. It's not the easiest stuff to apply, I'll admit. It drags a little, doesn't self-level, dries semi-matte, and smells a bit strange....but I don't even care. It could call me names and I'd still love it. The "french tip" look that it has above is just one of a few things I caught it doing. It's the result of warm hands encountering something cold. It can be air, water, fruit, a cold drink, whatever. It's not exactly instant, but it does happen in seconds. 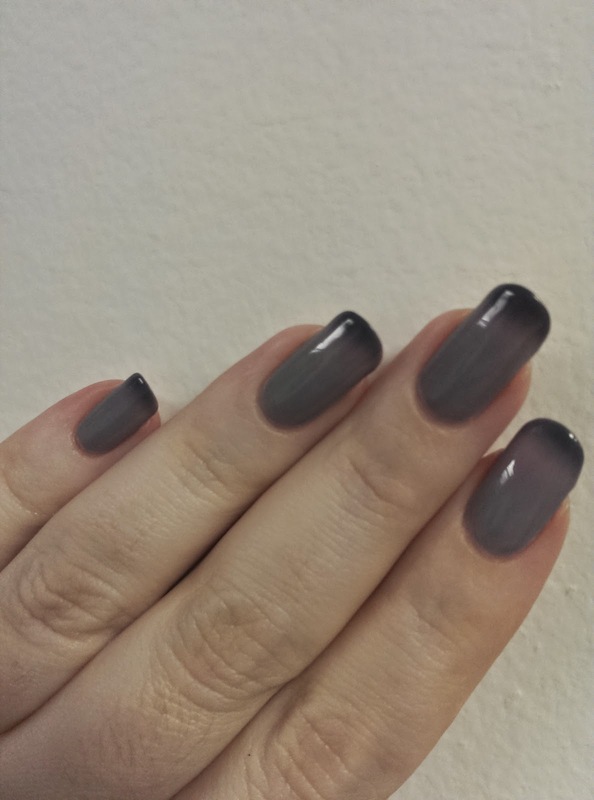 It fades as the tips warm up, usually sinking down the nail like a curtain. Sometimes the pink part will widen and spread out as the polish warms back up. 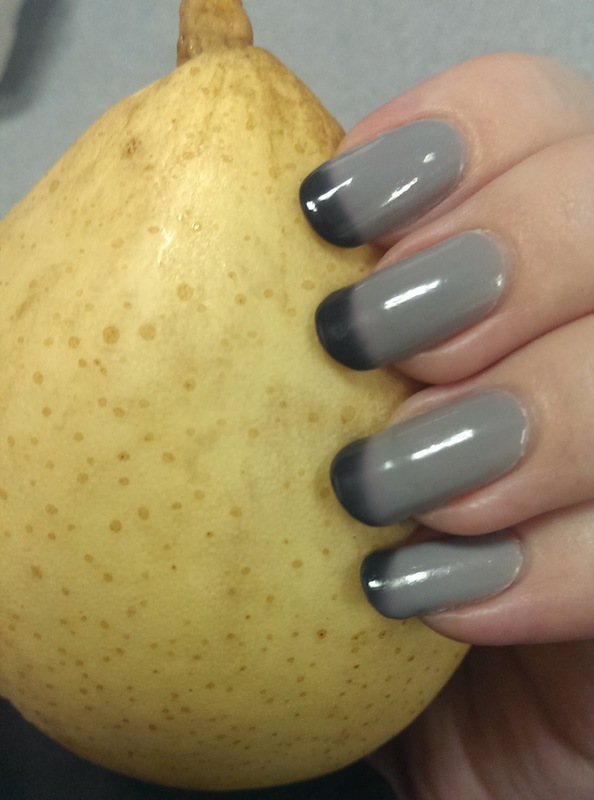 Warm nails in a warm room will be a solid light gray, sometimes with slightly pink tips. Cold nails in cold surroundings (or cold water) will be solid purple. The "trio" in this collection's name implies that there are only three colors, but there's way more to it than that. Exposed to very hot water, it turns a much lighter gray than it ever is on me otherwise. The dark purple on my pinkie is from a quick dip in cold water. Playing around in hot and cold water can cause some interesting results. 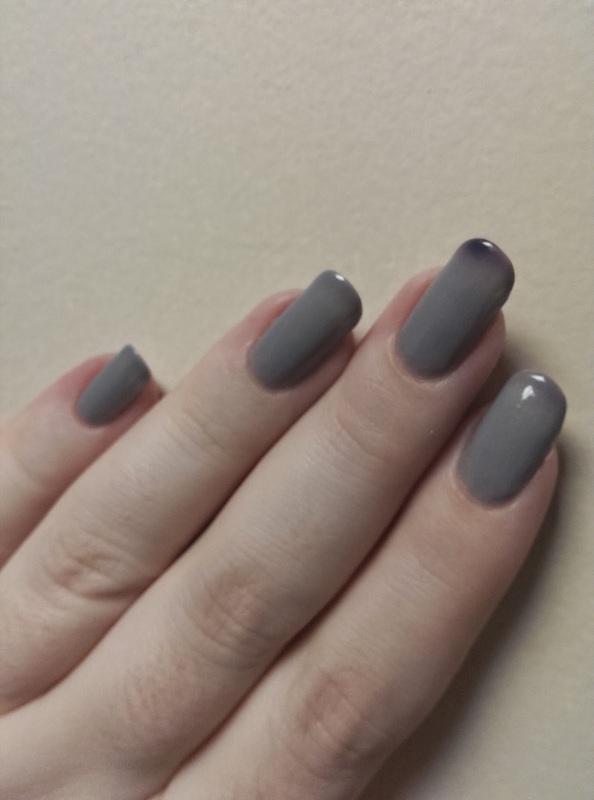 This is a polish to wear when you're out and about, and I took a bunch of photos with my phone too. 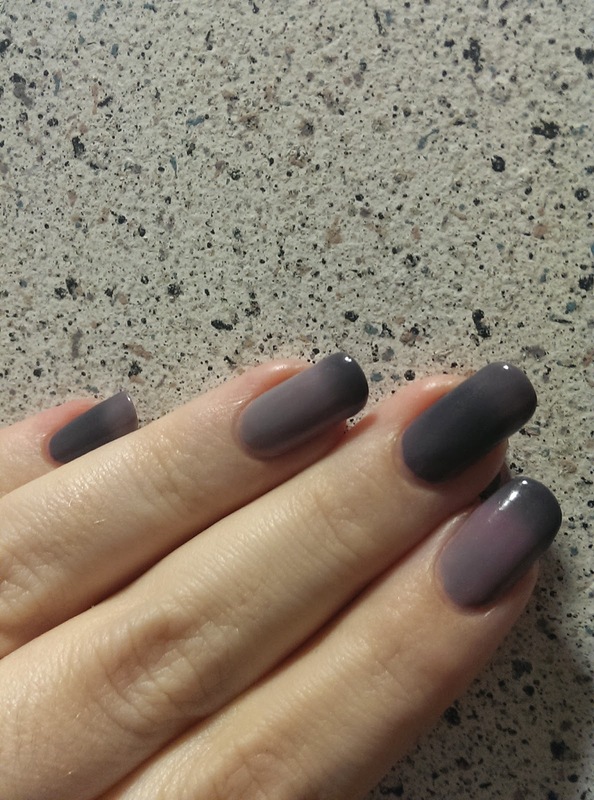 The best part of thermals is that you often get a surprise when you look at your nails. I had just a spot of purple sometimes. At another point, my fingers got really cold, but the rest of my hand was warmer. When I shut my hand, the tips changed on contact with my warmer palm. 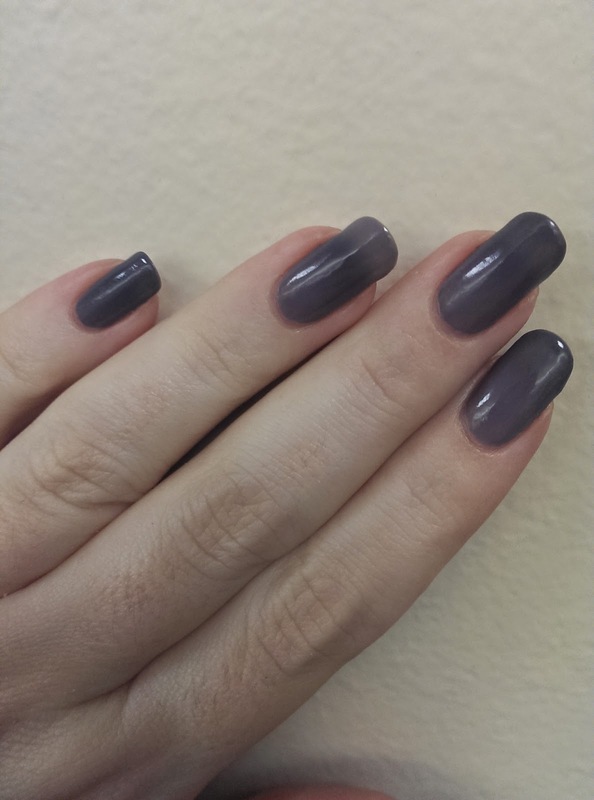 Cold hands in a colder room causes a darker, more subtle version of the "french tip" effect. Sometimes the pink intermediate color was surprisingly wide. 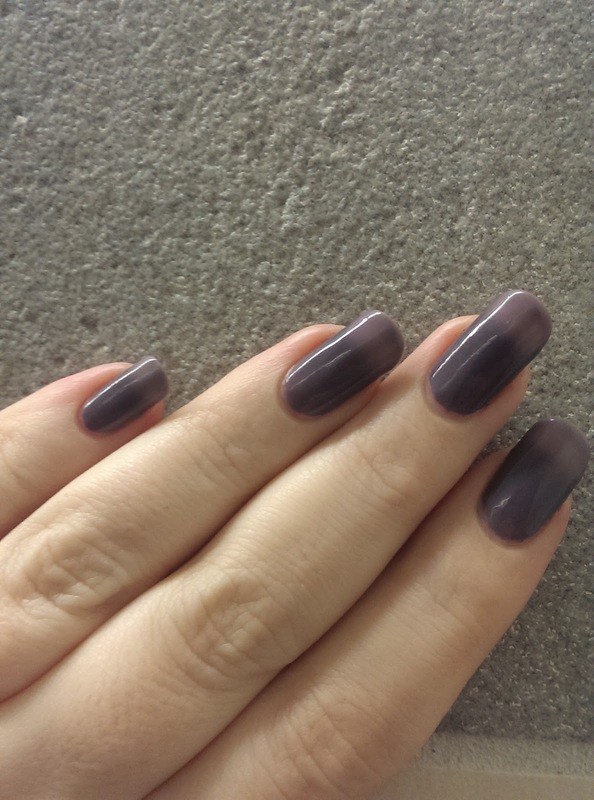 When my hands were especially cold, I could change the color of my nails by touching them with a warmer part of my hand. I had as much fun with that as I did with the water! Even holding cold fruit causes it to change! Three really is an underestimation of the number of colors that this polish can be! Bottom line: I love it so much! I've been wearing it since Friday and it's been keeping me entertained all weekend. 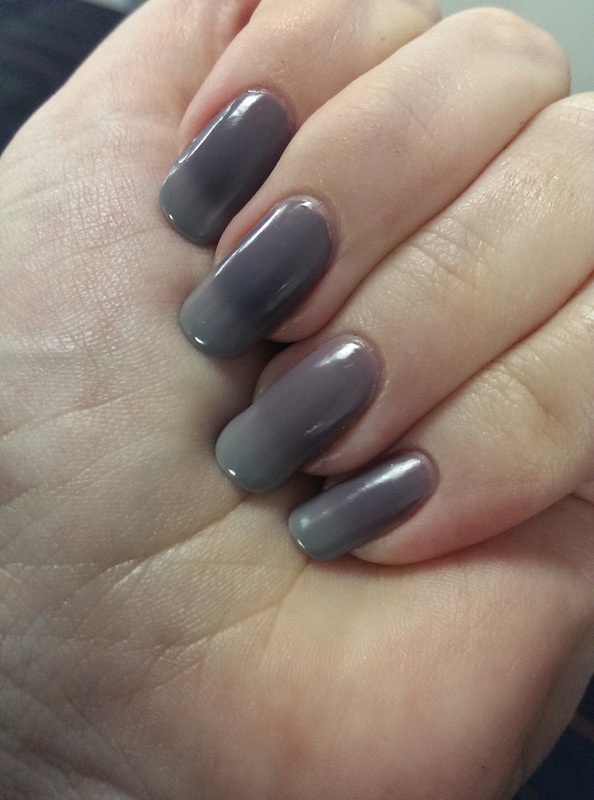 It's definitely better on longer nails and if you're going from warm to cold areas a lot. It's been unseasonably cold here the past few days and it's changed so much in the car that I was checking it at almost every red light. It could still be fun if you have short nails though, I'm sure! Do you have any thermals? Which are your favorites? I really really want this one! I ordered it from Llarowe once, but it never arrived (I did get a refund eventually). I was sad though - I wanted the polish!